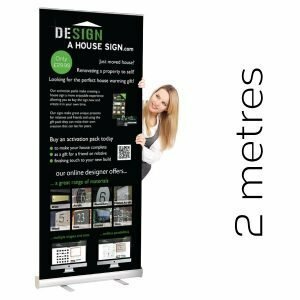 Roller banners, also commonly known as pop up, pull up or roll up banners, are one of the most popular, portable advertising displays used today. Being retractable, light-weight and low-cost has meant that roller banners are now used by most companies in some capacity to promote their brand, services, promotions and events. If you visit any exhibition, trade show or fair, either outdoors or indoors, you are likely to see businesses using roller banners as a great source of advertising. Here at Design a Sign we have years of experience producing high-quality printed roller banners for commercial and business use. We know that low-cost doesn’t have to equal low-quality. Our roller banners are made of premium block-out material with a weight of 500gsm, which means that they are tear-proof and built to last. All Design a Sign roller banners come with a 12 month warranty, just in case. We pride ourselves on ensuring that our customers receive the very best value and pride ourselves on our competitive pricing structure for all products. We are always checking our prices against our competitors and if you do find the same quality of banner cheaper anywhere else, we’ll refund the difference. Please refer to our Terms & Conditions page for full details on our refund policy. With so many companies offering cheap roller banners, we know that to protect our reputation as a leading print company, we need to produce excellent results every time. When printing our roller banners, we only use hard, weatherproof, UV-fading resistant eco solvent inks to ensure that your banner not only looks great, but that it is durable and suitable for both outdoor and indoor use. Eco solvent inks are biodegradable, have little or no odour and don’t contain harmful ingredients. As we are a one-stop shop for signage, our roller banners are supplied with a full colour printed graphic panel printed in house to suit our customers’ needs. We have two different design options to help create the perfect roller banner. We’re not just printing experts; we have a talented design team on site as well. Send us your brief after placing your order and we’ll design your very own bespoke roller banner, completely free of charge. Don’t worry if you forget to send your brief to us, we’ll be in contact if we haven’t heard from you in 24 hours. Do you have your own roller banner artwork ready? If so, you can upload it straight to your basket on the product page. 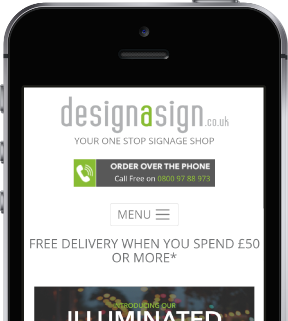 If you have any questions about your artwork or design, please get in touch with our design team via info@designasign.co.uk or 0800 97 88 973. Once you’ve confirmed the design of your banner, we’ll print it, fit it to the roller base, pack it and post it. Our roller banners are ready to use straight from the box, fold up neatly and come complete with a lightweight carry case for easy transportation. Starting at just £37.49, our roller banners come in two standard sizes (2m x 0.8m and 2m x 0.85m), but if you’d like to discuss other custom options to meet your needs, please do contact our production team for free on 0800 97 88 973; we’re always ready for a new challenge!